We live in a world of scarce understanding and abundant information. We complain that we never have any free time yet we seek distraction. If work can’t distract us, we distract ourselves. We crave perpetual stimulation and motion. We’re so busy that our free time comes in 20 second bursts, just long enough for us to read the gist and assume we understand. If we are to synthesize learning and understanding we need time to think. The modern storm of bits and stimulation, relents only when we sleep. (And then only if we remember to turn off the iPhone.) Lost in all of this is the art of stillness. We live in a world with more information than ever and yet we understand less. We have come into the belief that the simple act of reading confers understanding. Worse, most of our reading is elementary reading, or skimming — a far cry from syntopical reading, which seems more fertile for the mind willing to do the work. But that’s just it. We don’t want, or can’t find the time, to do the work that’s required to hold an opinion. It’s much easier to simply read the opinions of another and let them think for us. What’s worse is that we get confused. When someone else does the work we think we understand the problem better than we do. This is why Elon Musk asks questions of depth when hiring people. He wants to filter out the people who did the work from the people who took credit for the work. And so with thinking. Understanding comes from focusing, chewing, and relentlessly ragging on a problem. It comes with false starts, dead ends, and frustration. Thinking requires time and space. It’s slow. It means saying I don’t know. In short, thinking is everything the modern workplace is designed to eradicate. We’re expected to have an opinion about everything and yet our time to think is near zero. We hold more opinions than ever but have less understanding. We don’t even understand ourselves. How could it be otherwise? 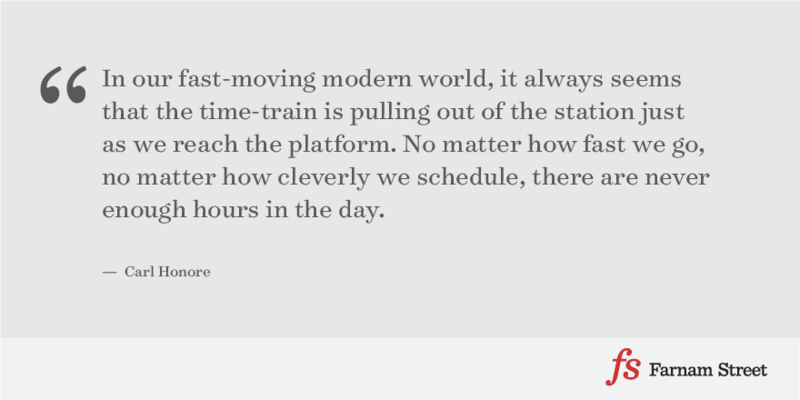 Carl Honore, wrote a book, In Praise of Slowness: Challenging the Cult of Speed, to explore why we’re always in such a rush, what if anything is the cure for time-sickness, and whether it’s desirable to slow down. The book is not an all-out declaration of war against speed. Speed has helped to remake our world in ways that are wonderful and liberating. Who wants to live without the Internet or jet travel? The problem is that our love of speed, our obsession with doing more and more in less and less time, has gone too far; it has turned into an addiction, a kind of idolatry. Even when speed starts to backfire, we invoke the go-faster gospel. We’ve become fast and fat. Overwork is a health hazard in other ways, too. It leaves less time and energy for exercise, and makes us more likely to drink too much alcohol or reach for convenience foods. It is no coincidence that the fastest nations are also often the fattest. Up to a third of Americans and a fifth of Britons are now clinically obese. … One reason we need stimulants is that many of us are not sleeping enough. With so much to do, and so little time to do it, the average American now gets ninety minutes less shut-eye per night than she did a century ago. “Inevitably,” Honore writes, “a life of hurry can become superficial. When we rush, we skim the surface, and fail to make real connections with the world or other people.” Moreover we don’t make connections with ideas. We don’t synthesize. We don’t test theories over time. We don’t play with ideas. The implications on thinking are fascinating. We are all fast-thinkers now. We have forgotten how to look forward to things, and how to enjoy the moment when they arrive. Restaurants report that hurried diners increasingly pay the bill and order a taxi while eating dessert. Many fans leave sporting events early, no matter how close the score is, simply to steal a march on the traffic. Then there is the curse of multi-tasking. Doing two things at once seems so clever, so efficient, so modern. And yet what it often means is doing two things not very well. Like many people, I read the paper while watching TV— and find that I get less out of both. In this media-drenched, data-rich, channel-surfing, computer-gaming age, we have lost the art of doing nothing, of shutting out the background noise and distractions, of slowing down and simply being alone with our thoughts. Boredom— the word itself hardly existed 150 years ago— is a modern invention. Remove all stimulation, and we fidget, panic and look for something, anything, to do to make use of the time. When did you last see someone just gazing out the window on a train? Everyone is too busy reading the paper, playing video games, listening to iPods, working on the laptop, yammering into mobile phones. 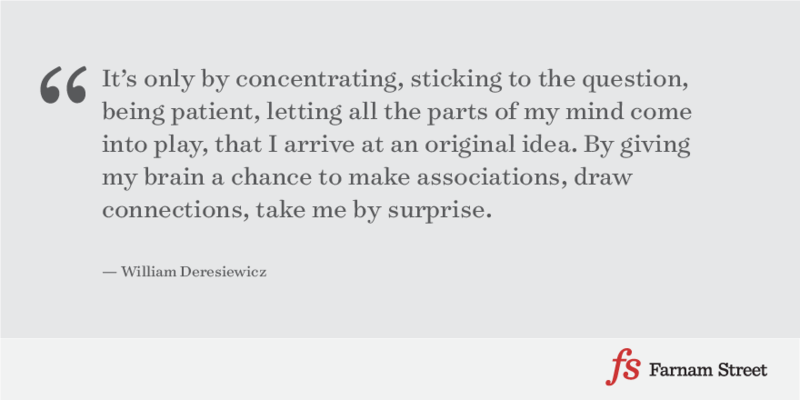 Instead of thinking deeply, or letting an idea simmer in the back of the mind, our instinct now is to reach for the nearest sound bite. In modern warfare, correspondents in the field and pundits in the studio spew out instant analyses of events as they occur. Often their insights turn out to be wrong. But that hardly matters nowadays: in the land of speed, the man with the instant response is king. With satellite feeds and twenty-four-hour news channels, the electronic media is dominated by what one French sociologist dubbed “le fast thinker”— a person who can, without skipping a beat, summon up a glib answer to any question. In a way, we are all fast thinkers now. Our impatience is so implacable that, as actress-author Carrie Fisher quipped, even “instant gratification takes too long.” This partly explains the chronic frustration that bubbles just below the surface of modern life. Anyone or anything that steps in our way, that slows us down, that stops us from getting exactly what we want when we want it, becomes the enemy. So the smallest setback, the slightest delay, the merest whiff of slowness, can now provoke vein-popping fury in otherwise ordinary people. Slow does not always mean slow. Fast and Slow do more than just describe a rate of change. They are shorthand for ways of being, or philosophies of life. Fast is busy, controlling, aggressive, hurried, analytical, stressed, superficial, impatient, active, quantity-over-quality. Slow is the opposite: calm, careful, receptive, still, intuitive, unhurried, patient, reflective, quality-over-quantity. It is about making real and meaningful connections— with people, culture, work, food, everything. The paradox is that Slow does not always mean slow. Speed is not always the best policy. Evolution works on the principle of survival of the fittest, not the fastest. Remember who won the race between the tortoise and the hare. As we hurry through life, cramming more into every hour, we are stretching ourselves to the breaking point. Fast eats time. One consequence of fast is that we make poor decision after poor decision. Those decisions don’t go away never to be seen again. It’s not like we make a bad decision and we’re done with it. No, the consequences are much worse. Poor decisions eat time. They come back to haunt you. They create issue after issue. They feed into the perpetual motion machine of busyness. And in a culture where people wear busyness as a badge of honor bad decisions actually lead us to think that we’re doing more.